The Marimaca property contains a number of N-S trending, ~60°E dipping, broad shear zones, cross cut by later NE-SW oriented sub vertical feeder structures, all hosted by Jurassic age intrusive rocks. The intersection of these structures has produced wide NW-SE oriented zones of eastward dipping mineralization that have been exploited from a series of open cuts and small underground workings by artisanal miners. Coro's program is the first ever drilling carried out on the property and tested the larger West Zone and a smaller East Zone; other zones of mineralization as defined by old workings, anomalous rock geochemistry and outcropping copper oxides remain to be tested. The West Zone is defined by a series of open cuts extending over ~700m length and was tested by holes MAR-02, -03, -04, and -08. All four holes intersected broad zones of good grade, mostly oxide mineralization over significant widths as shown in Table 1. Results are pending for the remaining 8 holes, MAR-09 to MAR-16, which were all drilled in the West Zone. 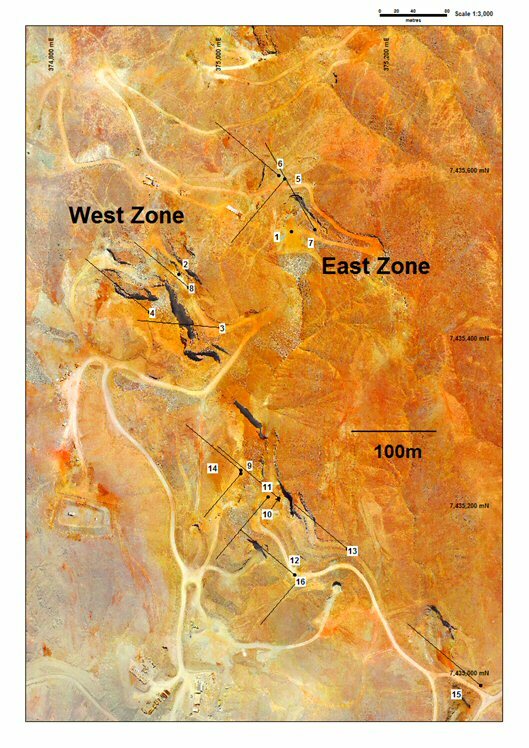 The East Zone is defined by geological mapping, old workings and anomalous rock geochemistry over a minimum length of ~200m and was tested by holes MAR-01, -05, -06 and -07. All four holes intersected good grade oxide, mixed and secondary sulphide (enriched) mineralization over significant widths as shown in Table 2. Alan Stephens, President and CEO of Coro commented, "We are delighted by these initial results from our drilling program at Marimaca with many holes bottoming in mineralization, and confirming the potential for a sizeable leachable copper deposit in a great location. We look forward to announcing the results from the second batch of drill holes, together with a fuller description of the mineralization, shortly." True widths cannot be determined with the information available at this time. Coro RC holes were sampled on a 2 m continuous basis, with dry samples riffle split on site and one quarter sent to the Geolaquim laboratory in Copiapo, Chile by Coro personnel for preparation and assaying. A second quarter was stored on site for reference. Samples were prepared using the following standard protocol: drying, crushing to better than 80% passing -10#, homogenizing, splitting and pulverizing a 400 g subsample to 95% passing -150#. All holes were assayed for CuT (total copper) and CuS (acid soluble copper) by AAS. A full QA/QC program, involving insertion of appropriate blanks, standards and duplicates was employed with acceptable results. Sergio Rivera, Vice President of Exploration, Coro Mining Corp, a geologist with more than 32 years of experience and a member of the Colegio de Geologos de Chile and of the Instituto de Ingenieros de Minas de Chile, was responsible for the design and execution of the exploration program and is the Qualified Person for the purposes of NI 43 -101. Alan Stephens, FIMMM, President and CEO, of Coro Mining Corp, a geologist with more than 39 years of experience, and a Qualified Person for the purposes of NI 43-101, is responsible for the contents of this news release. 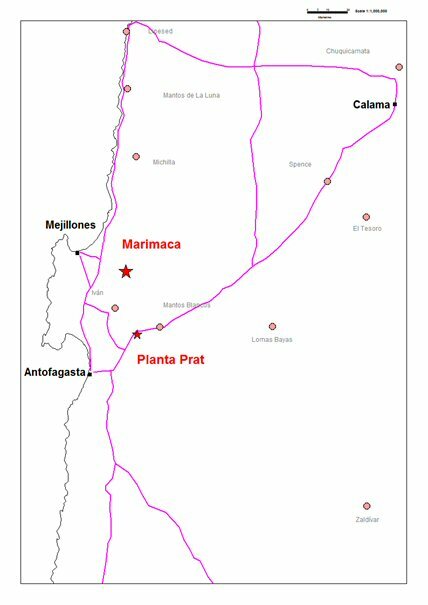 Marimaca is an early stage copper oxide prospect located in the Coastal Range belt of Mesozoic copper deposits of northern Chile. Other significant currently or recently producing deposits in the belt include Mantos Blancos, Michilla, Ivan and Mantos de la Luna.